After receiving his signature, the girl, softly crying, moved to the back of the room, where cardboard cut-outs of Overwatch heroes in NYXL garb stood headless, ready for a photo op. Overwhelmed, she refused her parents’ attempts to get her to pose for a picture. Later on, another fan gave Janus a pillow she’d knitted with his name on it. The New York Excelsior* had never been to New York before. (Every OWL team plays and lives in Los Angeles.) The NYXL—whose players are all Korean—is New York’s newest sports team in branding only, but they’re winners, and as a front-running New Yorker, how could you not love them? After a reverse sweep at the Overwatch League’s Stage 2 finals, NYXL won a cool $100,000 and headed out east to greet hundreds of fans who turned up to the Mets stadium for signatures. For hours, teammates Janus, Kim “Pine” Do-hyeon, Jong-yeol “Saebyeolbe” Park, Hong “Ark” Yeon-joon and Hwang “Fl0w3r” Yeon-oh sat at a long table as an assembly line of over 400 fans dutifully received their autograph along with a selfie. Attendees were voracious for face time with their local heroes who live in California. New York Excelsior walking around the city. The fan meetup went a little differently than originally planned. Paying homage to their owner, NYXL was slated to appear at the Mets’ second game this season. Fans would hang out with the team during batting practice and, at 7:08 PM, Saebyeolbe, the world’s best Tracer player, would throw the first pitch, a possibly high bar for an esports star. It wasn’t meant to be, as it snowed yesterday morning and the game was postponed to July. Fans who muttered that they’d mostly just purchased the t-sports tickets to meet their esports idols were relegated to a nearby brewery. In $70 unofficial NYXL jerseys and $60 official Overwatch hoodies, attendees slowly came in from the cold in a line that coiled around itself. Before NYXL debuted, they were separated from fans in a glass room where they could eat in peace, like Keith Richards devouring shepherd’s pie before a show. Saebyeolbe, looking only mildly disappointed about his missed baseball opportunity, made his way through the crowd in a bomber jacket covered in pink flowers. A Tracer toy, a gaming mouse and a PC side panel were all presented to him for a signature. A fan’s sign for New York Excelsior player Janus. In the months between NYXL’s inception and rise to the league’s number one slot, New York-based fans’ ability to express their devotion was limited to Twitch chat, Reddit, Twitter and other social media. The League’s slick, polished streams had these players looking like untouchables. At the meet-up, fans finally had the chance show their love, to interact. A few gave pros handmade tokens of their adoration, along with effusive comments about their Stage 2 gameplay. At one point, about an hour and a half in, Saebyeolbe knocked a glass off the table. It fractured loudly. After a short silence, there were wild cheers and applause while the red-faced Overwatch pro smiled a little awkwardly. New York Excelsior giving autographs outside the Mets stadium. 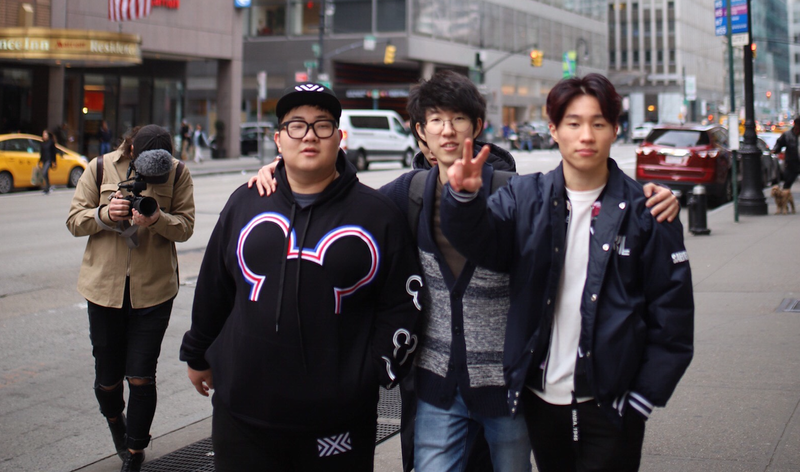 With only a weekend in the city, the boys only had time to hit the major tourist spots—Times Square, etc.—plus the local LAN cafe that livestreams their games, an unofficial hub for NYXL fandom. I had a burning question for Ark: Did they try New York pizza? They are famous, after all, and these days, all fame is relative—esports or Mets players, culture is fractured, and so when you’re big in your niche, you’ve got to live it up. Ark later confessed that a portion of his Stage 2 earnings went toward dinner at Per Se, a three-Michelin-star $340 fixed price French restaurant on the fourth floor of the Time Warner Center. It was Ark’s first time eating fancy food, he said, so he wore his dress shoes.